A luxury day... enter the fantasy of a beautifull romantic palace, the charm of Sintra village and cosmopolitanism of Cascais and Estoril. We leave in direction of the majestic and romantic Pena Palace, an astonishing fairytale castle, located in one of the highest peaks of Sintra mountain range. At the end of the morning free time to walk in the streets of the village of Sintra (Cultural Landscape by UNESCO) that enchanted Kings and inspiredpoets to appreciate the several handicraft shops and tea-rooms to taste the delicious local sweets like the "queijadas" or the “travesseiros”. We leave to Colares*, region demarcated and recognized for its table wines, following until Cabo da Roca, the most western point in continental Europe, passing for the beach of Guincho until Boca do Inferno always sea viewing enjoying the landscape until Cascais where we take a glimpse of the fishing port. We return to Lisbon by Estoril Coast where we can have a panoramic view of the Casino and its gardens. 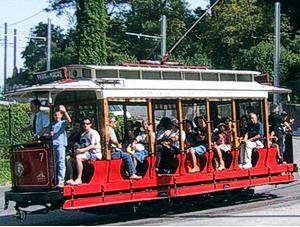 * Travel by tram (Colares-Sintra) from April to October on Tuesday, Wednesday and Thursday. The other days by bus.